Without the garlic bread (for which I used Against the Grain’s Gluten Free French Loaf and butter), this meal is vegan. I’m cutting out dairy but didn’t want to throw away half a loaf of awesome bread. So vegetarian and gluten free. Vegan if you have vegan bread. You can use olive oil, garlic and basil to make a nice topping for garlic bread. Broil on high for about 3-5 minutes, watching closely for your kitchen to catch on fire. Such is the life of someone who doesn’t broil very often. BUT I DID NOT BURN MY BREAD TODAY. Veggies for sauteeing: I used snap peas, baby bella mushrooms, a yellow bell pepper, and an orange bell pepper. This would also be great with asparagus. In a tofu press, press the tofu until as much water as possible has been drained. Then pour in a small bit of olive oil and 2-3 tablespoons of balsamic vinaigrette. Marinate for at least an hour. Wash your salad and vegetables thoroughly. Chop veggies, setting cold veggies in one bowl and hot veggies in another bowl. Set out plates with your base salad and the cold veggies so you have them ready for later. Chop about 1 tablespoon of ginger root into very small pieces (or grind). Crush or grind at least 3 cloves garlic. In a large skillet, heat olive oil, several tablespoons of balsamic vinaigrette, and 2-3 tablespoons of honey. When water begins to evaporate from vinegar, add garlic and ginger root. Cook until fragrant. Add hot vegetables. While the ginger and garlic are cooking, take out tofu and cut into small squares. Toss squares with remaining marinade. Add to oil/vinaigrette mixture. Cook for 1-2 minutes, until squares are thoroughly saturated. Add veggies to be sauteed. Saute veggies until tender and fragrant. 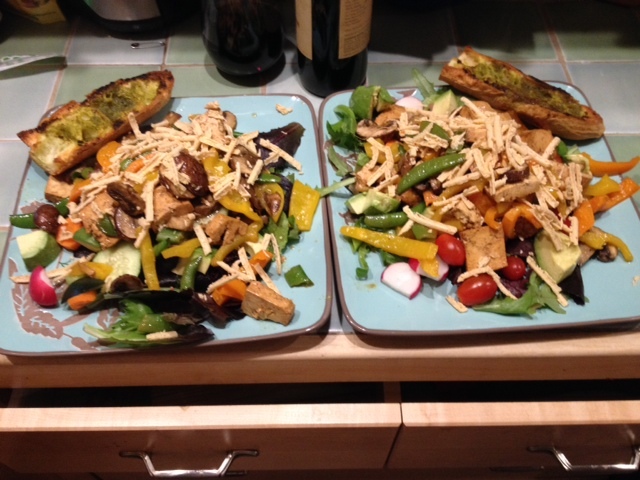 Add hot veggie/tofu mixture to salad, making sure to pour any extra oil/vinaigrette mixture onto salads. Salt and pepper to taste. The daiya cheese tasted good, but honestly the salad didn’t need it. I won’t add it when I make it again, but I will add asparagus. This salad was unexpectedly satisfying and flavorful. The honey and balsamic vinegar compliment one another nicely, and the olive oil & avocado are healthy fats. This meal is high in fiber and nutrients. It is NOT a cheap salad to make unfortunately, but it is delicious. I will be making this salad for a future episode of #cookingwithjoanne on Twitter. Made this dish tonight inspired by this recipe which called for shrimp. Slice the mushrooms, onion, garlic, basil. Heat olive oil in a skillet. Add garlic, basil, dash of salt, liberal black pepper, paprika. Heat for one minute, until garlic is aromatic, add onion. Add mushrooms and frozen spinach. Mix well until everything is coated with the oil and spices. Cover and cook over medium until mushrooms are desired tenderness. Spray with lemon juice. Layer over polenta. Serve. If you have made your own polenta, just add the cheese, stir until melted and serve. If you are using premade polenta, cut it into chunks. With a potato masher, get to mashing that polenta. When it’s really mashed, switched to a spoon and stir that polenta. Add the cheese. Stir until the cheese has melted. When the cheese has melted, YOU ARE DONE. 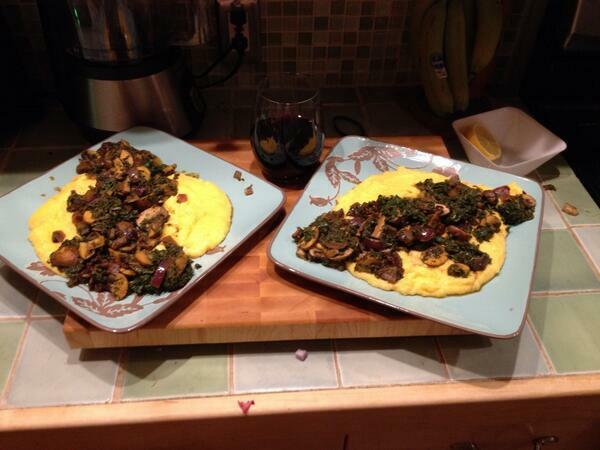 Spoon the polenta onto a plate, cover with the veggie mixture. Eat and be happy.